At tonight's first Vespers for tomorrow's solemnity of Saints Peter and Paul -- the patrons of Rome -- Pope Benedict went public with one of the Vatican's worst-kept secrets of recent months, formally announcing the creation of a Pontifical Council for the New Evangelization, the first Curial dicastery to be established from scratch in over a quarter-century. While the pontiff didn't disclose the identity of his choice to lead the new Council, the lead Italian vaticanista Andrea Tornielli of Il Giornale -- who forecast the office's creation in late April -- previously tipped Archbishop Rino Fisichella, currently head of the Pontifical Academy for Life (and the de facto "chaplain" to Italy's political class), for the post. The office's genesis came from two prominent exponents of the "new movement" closest to Benedict, Comunione e Liberazione; the late CL founder Msgr Luigi Giussani proffered the idea to John Paul II as far back as the early 1980s, and the thought was recently revived to Benedict by the movement's highest-profile ally after the Pope, the patriarch of Venice Cardinal Angelo Scola. Pope Benedict chose the Church the first great Christian missionary – St. Paul – to announce a new Pontifical Council dedicated to the evangelization of secularized Christian nations. The Pope was celebrating the Vespers of the Vigil of the Solemnity of Sts. Peter and Paul in the Papal Basilica of St. Paul Outside the Walls. During his homily, he spoke of how his predecessor, Pope John Paul II, had urgently proclaimed a new evangelization, aimed at countries which had long before received the Gospel. 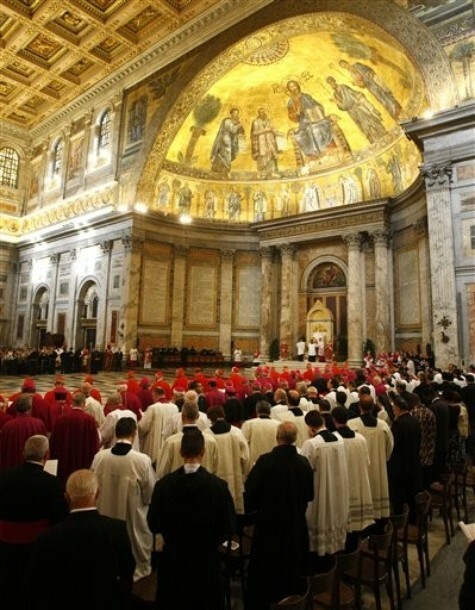 Pope Benedict said he received this legacy upon his own election to the Chair of Peter, and noted the challenges of the present time are mostly spiritual. 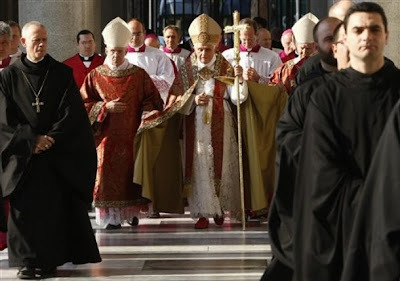 He said he wanted to give the new Pontifical Council the task of promoting a renewed evangelization in countries with deep Christian roots which are now experiencing a sense of the “eclipse of God”, and becoming increasingly secularized. He said this situation presents a challenge in finding the appropriate means in which to revive the perennial truth of the Gospel of Christ. Of course, the presidency of the new council only adds to an already significant docket of Curial posts that stand to be filled over the coming weeks and months, including the top posts of the Congregations for Bishops, Clergy and Religious along with the presidency of the Pontifical Council for Promoting Christian Unity, where Cardinal Walter Kasper -- the eldest dicastery-head -- confirmed that his retirement was near at a weekend press-conference. Kasper reached the traditional retirement age of 75 in March 2008. Especially given the record of heightened Jewish-Catholic tensions over the course of the current pontificate, it's worth recalling that the holder of the Christian Unity portfolio additionally plays the Vatican's lead role on relations with Jews.